Back in the day, almost every residential Detroit street was lined with big elm trees that formed shady, green tunnels. That’s why Detroit was once called “The City of Trees”. 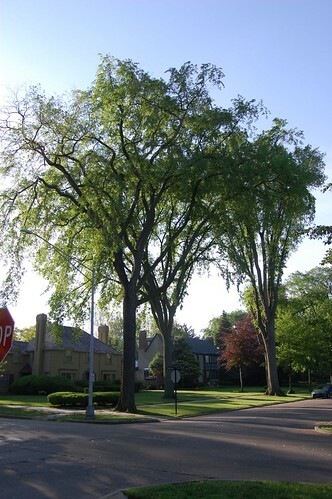 Unfortunately, Detroit has been losing trees throughout the city at an alarming rate since the 1950s when Dutch elm disease pretty much wiped out the elm trees on most streets. Ash trees were planted to replace the elms, but the emerald ash borer beetle is now wreaking havoc on the ash trees throughout the region, leaving many Detroit neighborhoods treeless and barren. Without trees, there are less ways to soak up moisture during rain storms and snow melts. This causes problems with the sewer systems. Older cities like Detroit have antiquated gray infrastructure — meaning pipes and sewer systems that are unable to manage heavy rainfall. When the system overflows, raw sewage overflows into clean water, polluting rivers and lakes and flooding basements. Using green infrastructure is a healthy, economic alternative method to stormwater management. Trees planted in targeted areas help absorb moisture and reduce flooding. The Greening of Detroit, a nonprofit organization that has planted 82,000 in city since 1989, is partnering with the city of Detroit’s Water and Sewerage Department to facilitate large-scale tree plantings in neighborhoods where stormwater runoff and flooding are common problems. Big tree planting projects in targeted neighborhoods are being used to help solve the overflow problem and clean up the water system in a cheap and effective way.